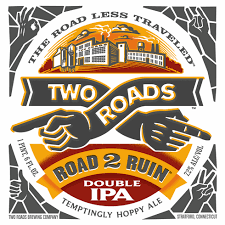 TWO ROADS ROAD 2 RUIN DOUBLE I.P.A. Big bitter beer will please hearty hopheads with its pungent grapefruit peel bittering, resinous hemp-oiled hop char and harsh ethanol whir. Counteractive sugar-spiced floral respite fortifies ancillary nectarine, peach, apricot, apple and tangerine tang.